How Much Does it Cost to Get Married in Vegas? Find out here ! How Much Does it Cost to Get Married in Las Vegas? Are you engaged and planning a wedding? Or are you and your significant other thinking of eloping? Whichever category you fall into, you’re likely concerned about how much to budget for the big day. Since the average American wedding costs over $35,000, this is a legitimate concern for many couples. One possible solution to getting married on a budget is a destination wedding in Las Vegas. But how much does it cost to get married in Vegas? Is it really as cheap and easy as it’s portrayed in the movies? Read on to learn more about the costs and things to consider for a Vegas wedding. Is a Vegas Wedding Right For You? Before you book two flights to Nevada, you need to be sure that a Vegas wedding is the right choice for you. Have you always dreamed of a large, opulent wedding? Does your guest list include hundreds of friends and family members? Would your family (or future in-laws) feel disappointed by the idea? If you answered “yes” to any of these questions, you may want to stick with a more traditional wedding. If a Vegas wedding sounds appealing, your next step is to determine what type of Vegas wedding you want. How much does it cost to get married in Vegas? The answer depends entirely on what type of Vegas wedding you choose. A private ceremony at a small chapel off the Strip could cost as little as $100. A ceremony for you and your families at one of the luxury hotels on the Strip could cost tens of thousands of dollars. What kind of setting do you envision? An outdoor garden? A historic wedding chapel? A five-star resort? Ultimately, your wedding can be as expensive or inexpensive as you want it to be. It can also be as traditional – or untraditional – as you like, too. Want to get married by Elvis Presley? Share your nuptials under the iconic Las Vegas sign? Walk down the aisle in blue jeans and cowboy boots? Whatever type of wedding you want, there’s a Las Vegas wedding package that’s perfect for you. So, How Much Does It Cost to Get Married in Vegas? Now that you know about the different types of Vegas weddings, it’s time to talk dollars and cents. How much does it cost to get married in Vegas? Let’s break down the costs one item at a time. One of the reasons Las Vegas hosts 120,000 weddings each year is because it’s so easy to get a marriage license. The current cost of a marriage license in Nevada is $77. While other states require blood tests and a lengthy waiting period, Nevada requires neither. Walk into the Clark County Marriage License Bureau. Hand over your identification and $77. That’s it! In many instances, the entire process takes less than 15 minutes. Your marriage license is good for up to a year, and you can use it as soon as you exit the License Bureau. Once you’ve had your wedding ceremony and it’s registered with the Recorder’s Office, your marriage is officially legal. If you really want to cut down on costs, you can find a marriage commissioner’s office near the License Bureau. Most commissioners will perform a brief civil ceremony for about $50. Depending on which chapel and type of ceremony you choose, prices may range from a few hundred to a few thousand dollars. 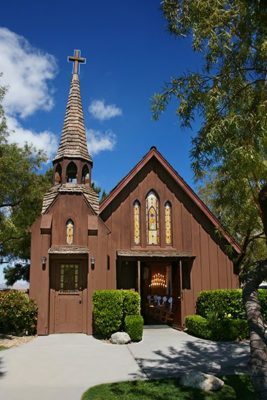 For example, at the historic Little Church of the West, a private ceremony including professional photos starts at $209. A VIP package including professional photos and video, flowers, two limousines, and a bridal suite costs $2,975. As you can see, there are no hard and fast rules for wedding prices in Las Vegas. Some chapels charge more, some charge less. A wedding at a luxury resort on the Strip may cost as much – or more – than a traditional wedding back home. On the other hand, a ceremony in a commissioner’s office may cost less than your breakfast. Whichever type of venue you choose, there are wedding packages available to suit all needs and budgets. Most chapels don’t allow an outside minister or official to perform the ceremony. Many assume that the minister’s fees are part of the price of a Las Vegas wedding package. Generally, that isn’t the case. While some chapels may include it, expect to pay anywhere from $50-$100 for a minister’s fee. It’s also customary to tip the minister after the ceremony. Like the minister, a photographer may or may not be part of your wedding package. If he is, the price likely includes his services but not the actual photos or videos. Depending on the size and number of the photos you purchase, this could add a few hundred dollars to the cost of your wedding. Alternately, some chapels may offer photos on a USB drive for you to print at home yourself. So, how much does it cost to get married in Vegas? The answer depends on you and what your vision of your wedding day entails. Whether you want a no-frills civic ceremony or you want to dance down the aisle with Elvis, you can make your Las Vegas wedding whatever you want it to be. Are you interested in a beautiful Las Vegas chapel where many celebrities have tied the knot? We invite you to contact us at The Little Church of the West to discuss your wedding ideas with us.